Life with Lucie & Ella: Family Fun in February! January always flies by for me. I guess it probably has something to do with planning two birthday celebrations in the course of a month. I didn't help things that the girlies got sick in January either. I felt like I was in a cave for a couple of weeks. But, I'm finally getting to the point where I feel like I can relax a bit and get into a more regular schedule. And I'm looking forward to February! Last month, I decided to try to be a bit more deliberate in planning fun stuff to do with the girls. I even made a fun little checklist sheet to help them get involved in the planning. While we didn't exactly stick to our list, we DID have a lot of fun in January. Personally, I enjoyed the indoor snowball fights, doing crafts together, and of course the birthday parties. So, we're going to try to keep the fun going in February. I really hope to do a bunch of Valentine's Day stuff with the girls. We really enjoy making our own Valentine's Day cards so I hope that we'll do that again. 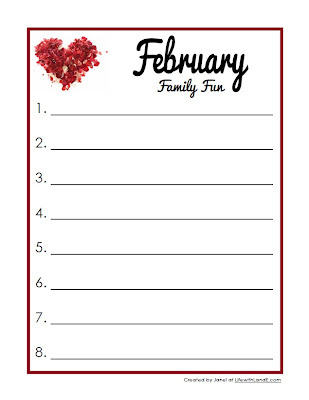 If you want to be more intentional in your Family Fun, download the February Family Fun Printable and brainstorm with your family. Here are a few ideas that might make February a little more fun. 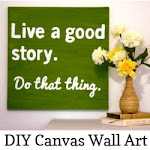 Make words for your mantel. I just love my "Love does." decor that's on my mantel. Kids can help decide on the words, trace out the letters, and even assemble them depending on their skill level. Make a sparkly heart garland. I haven't done this but I think my girls would enjoy it. Make heart-shaped salt dough candle holders. 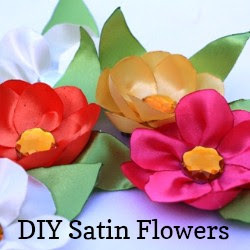 This is an easy craft to do with the kids. I think I might turn mine into a centerpiece for our dining table. They'd look pretty for an at-home Valentine's dinner. 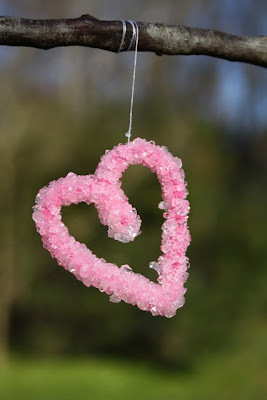 Make heart-shaped borax ornaments. They'd look pretty hanging in the window. Creme Brulee. This is one of our family's favorite desserts. Plus, it's always fun to bring out the torch. Cupcakes with Homemade Buttercream Frosting. The girls LOVE making cupcakes and LOVE adding sprinkles. I pipe on the frosting so it looks fancy. 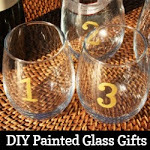 Want more Valentine's day ideas? 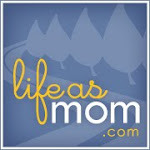 Check out DIY on a Dime: Valentine's Day at Life as MOM this month!